The WaterPACK/​ILS Farm is owned and operated by the Innovative Livestock Solutions Partnership. The cooperator, ILS, was approached by the Water Protection Association of Central Kansas (WaterPACK) who initiated and provided funding for this project. Two adjacent center pivots (Fields 15 and 16) are involved located about 6 miles northeast of Belpre, KS or about 18 miles south of Larned, KS in Pawnee County. The ILS Farm in Pawnee County is comparing MDI, to regular spray nozzles on a higher volume well than those wells being studied in Finney County. Two corn circles were involved; the South circle was fitted with spray nozzles and planted in typical straight rows and the North circle has its three outer spans fitted with two sets of application packages and planted in circle. Half of the spans has MDI and the other half has spray nozzles. To verify the discharge, four drops in each span has water meters installed. Irrigation scheduling using weather-​based and soil water sensors was implemented on this farm. 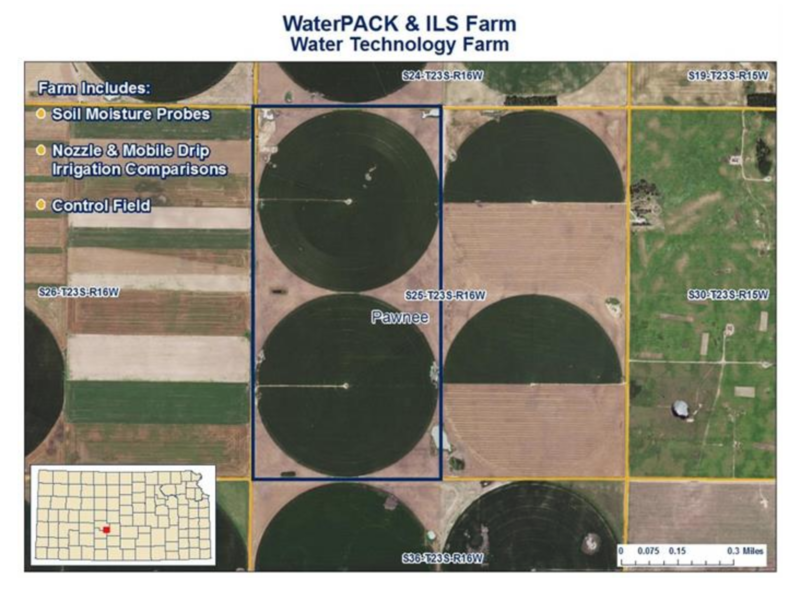 The ILS Farm is about finding the most efficient irrigation water application package that will work well with an irrigation scheduling tool. More information about Water Technology Farm field days from Southwest Research-​Extension Center.